A delicious grain-free cinnamon raisin bread. Many grain-free bread recipes call for Stevia, but I found coconut sugar & raw honey work great as an alternative, natural sweeteners. Give this recipe a try. We’ve been trying a lot of Paleo bread recipes lately but so many haven’t turned out well. I’ve found the key really comes down to finding the right mixture of flours. I was inspired to make this recipe after reading The Joy of Gluten-Free, Sugar-Free Baking. There are many grain-free bread recipes that can be easily modified to to be Paleo friendly. I did find many of the recipes called for Stevia (which we avoid), but I found coconut sugar and raw honey work great as an alternative, natural sweeteners. Even my kids kept coming back for seconds. Raisin bread is not a savory bread that you would use to make sandwiches. It’s a soft, moist cake-like bread (think banana bread) that’s sweet and makes a delicious snack or breakfast. 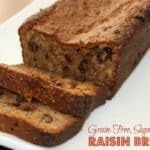 There are all different types of raisin bread recipes out there but this one is healthy and made with whole foods. It’s absolutely delicious and so easy to make, something you’ve got to try! This Grain-Free, Sugar-Free Raisin Bread recipe came out delicious. I toasted it and topped it with butter… and it was scrumptious. Try it with a bit of fig jam to bring out the raisin flavor. You can make this recipe vegan as well (I’ve noted options below). I get my kitchen pantry supplies like sea salt, black pepper, spices, coconut oil, and other essentials either on Amazon or my local health food store usually. A delicious grain-free cinnamon raisin bread. Many grain-free bread recipes call for Stevia, but I found coconut sugar & raw honey work great as an alternative, natural sweeteners. Preheat oven to 375°F/190°C degrees. Grease a standard loaf pan with a little butter . Mix all the dry ingredients in a medium bowl. Mix all the wet ingredients (milk, butter and eggs) in a large bowl using an electric mixer on a medium setting. Slowly add the dry ingredients and keep mixing for a few minutes. When done mixing, pour into the loaf pan and bake for 35-40 minutes or until done (test with a toothpick). Let cool in the pan for 5-10 minutes, then cool on a wire rack for another 10-15 minutes before serving. This looks so delicious and easy, I’d love his for breakfast with a cup of coffee! Paleo diets are usually do not include dairy. How would you alter this recipe to not use butter? I would try Earth Balance, a non-dairy vegan margarine. I’ve also tried applesauce instead of oil/butter in traditional baking but haven’t tried it with paleo. I’d love to hear your experience.